For tests without own installation of the FCpro server the testserver provided by us in the internet can be used. 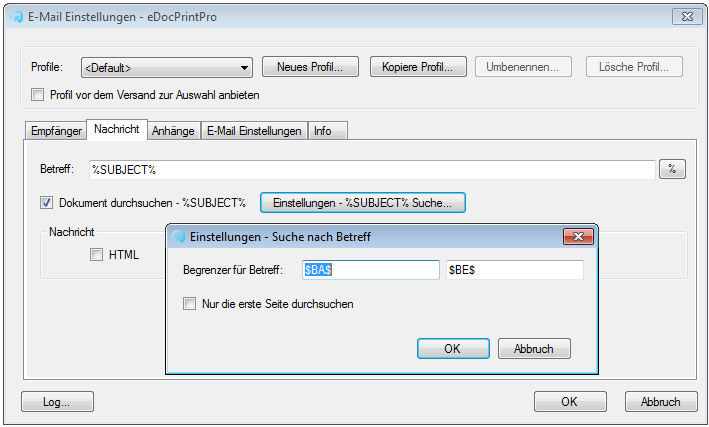 The existing eDocPrintPro e-mail plugin can search and extract e-mail addresses and subject via configurable delimiter in the created PDF and use them for the distribution of the e-mail. What has been missing yet however was the possibility to also redefine the name of the created PDF and use it as attachment name. 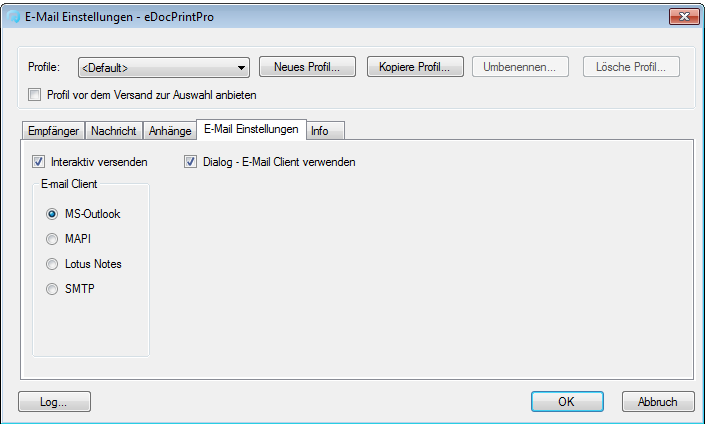 The eDocPrintPro “ExtRen” plugin now offers this possibility and combines the reassigning of the file name via extracts from the PDF document with the skills of the existing e-mail plugin. definition of variables for the destination file name / attachment name and path – delimiter – beginning / end, search in – first page / all pages / last page. 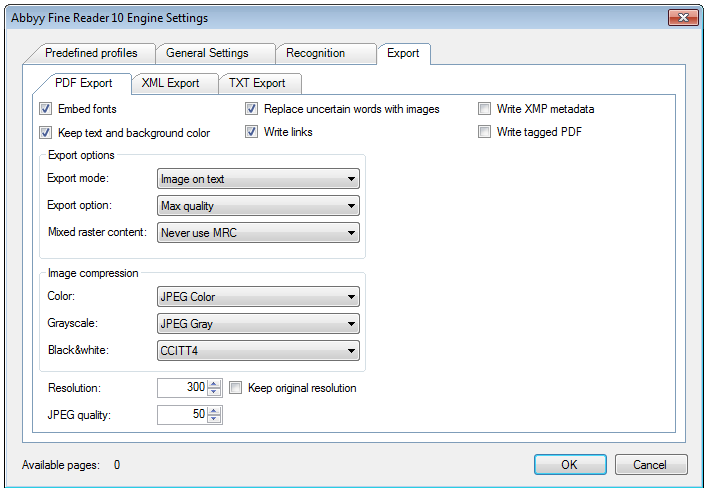 determining of name rules for the new file / attachment name via fixed (date, time, workstation name, username, origin name, counter) or free defined variables whose values get extracted from the PDF. start folder if the file is only stored and not sent as attachment. path configuration via variables like for the file name incl. 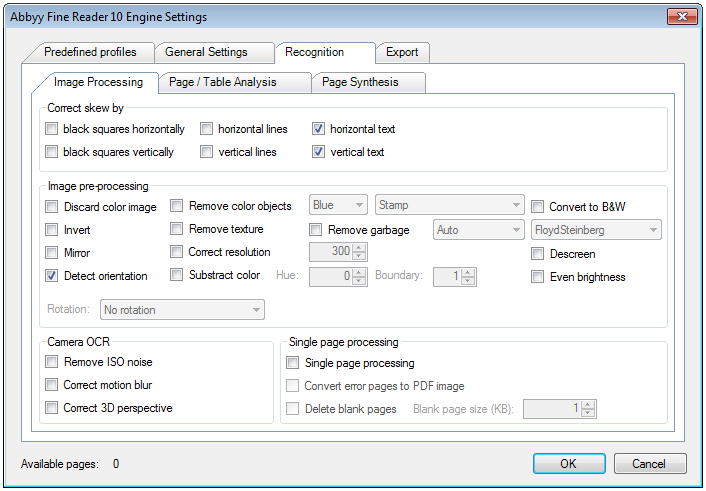 free defined variables whose values get extracted from the PDF. 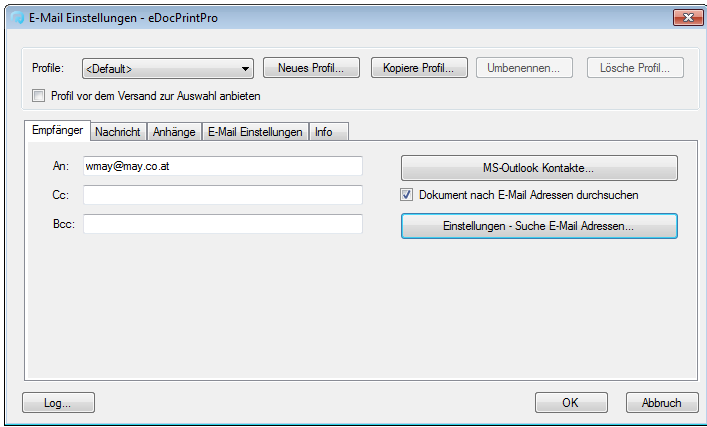 all other functions see eDocPrintPro e-mail plugin. 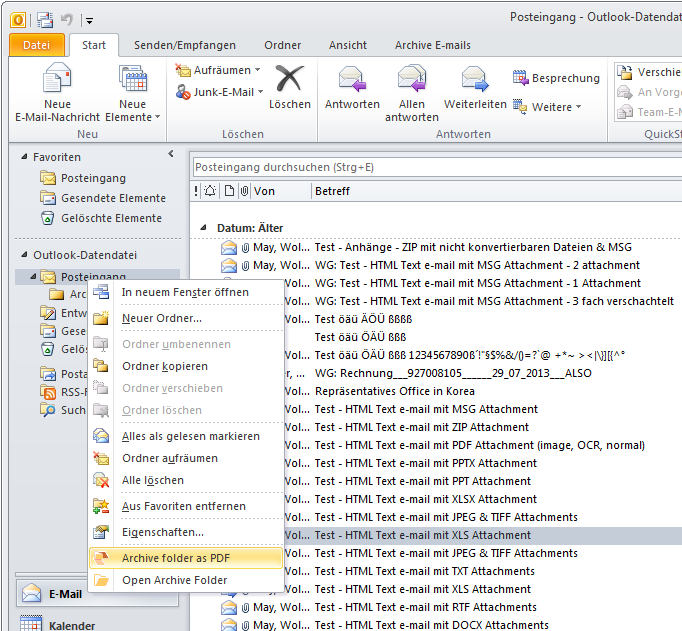 The EMail Archiver is a plug-in for Microsoft Outlook 2010 / 2013 with which single or multiple marked e-mails or even whole e-mail folders and subfolder with all contained e-mail messages can be converted to PDF or PDF/A. The processing and conversion of the e-mail takes place via the FileConverterPro server which is called encrypted via https either in the local network or external over the internet. The resulting PDF(/A) is deposited in configurable start-folder in the file system. 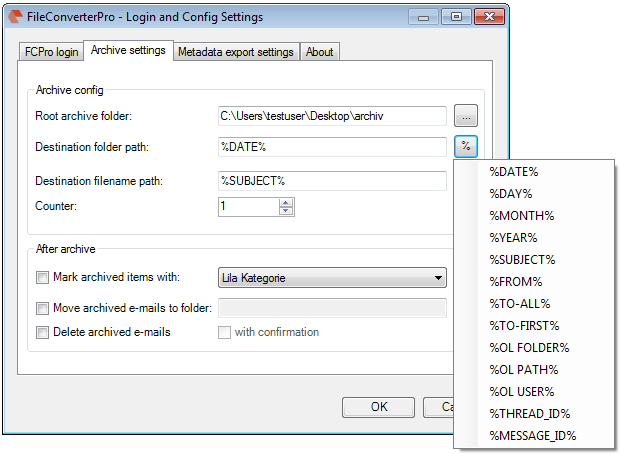 The path as well as the file names get configured and created via variables which are retrieved from the metadata of the e-mail message. Additionally the metadata can be written as a XLS table. PDF and especially PDF/A-3 are particularly good for the archiving or ISO standardized long-term archiving of e-mails. 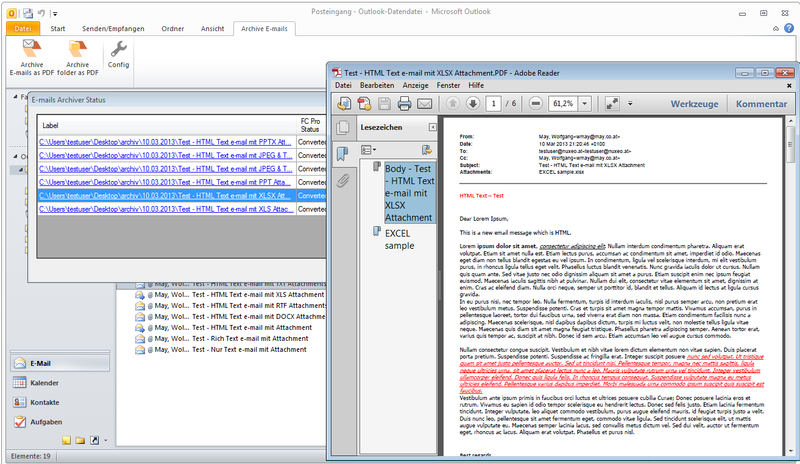 With PDF/A-3 the original MSG / EML message and the contained attachements get embedded in the PDF container also. 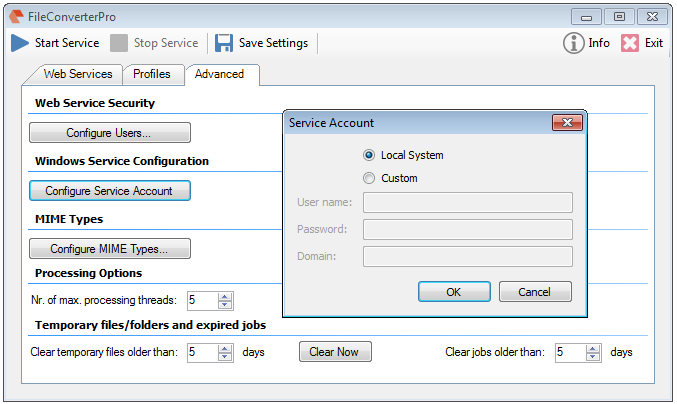 FCpro login configuration – URL, username, password, FCpro – choose processing profile, connection test with the FCpro server, priority of the jobs. 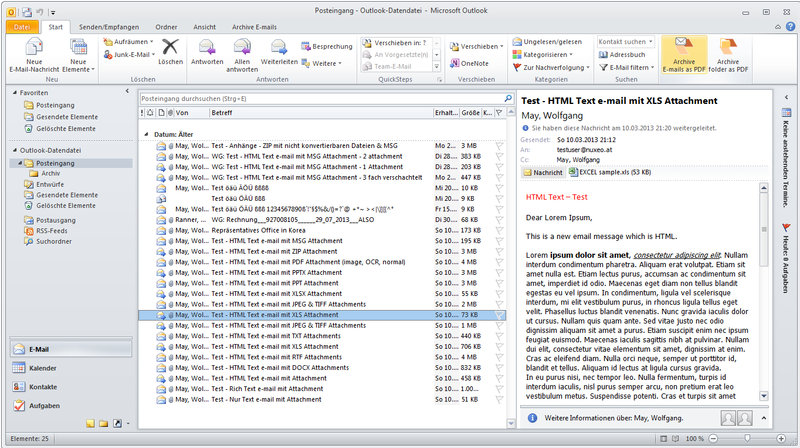 Configuration destination path through variable: (date, day, month, year, subject, from, to (all), to (first), Outlokk folder name, Outlook path, Outlook user, email-thread-ID, email-message-ID). Configuration destination file name through variable: same as for the path incl. counter. 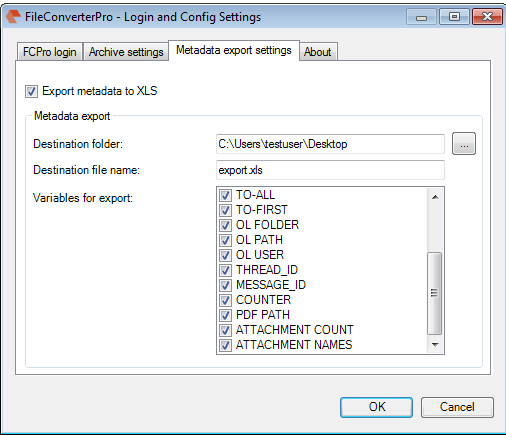 Metadata export settings – export metadata as XLS – for any archived email a new line is inserted into the XLS. One or multiple marked emails from the e-mail list – function in the context menu, or buttons in the “Start” or “Archive emails” tab. 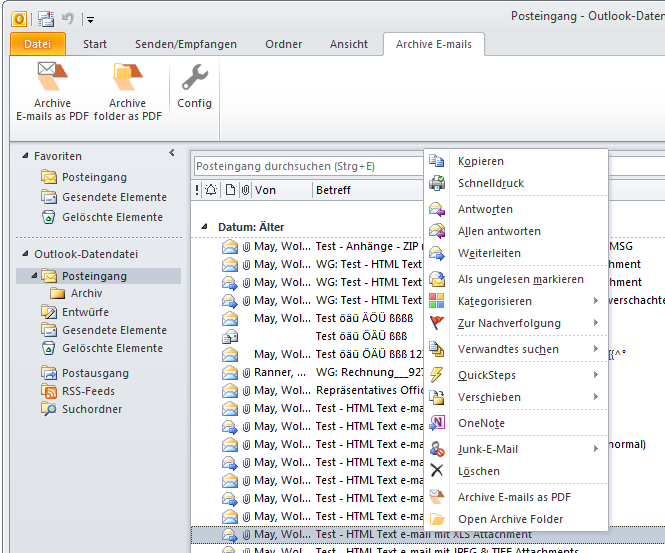 Archiving of single emails from the mask of the currentyl opened email view. Display of the currently pending e-mails for processing / conversion / archiving – label of the e-mail, FCpro status, archive status. After the successful archiving the label changes to a link of the archived email. Via this link the created PDF can be called and viewed. 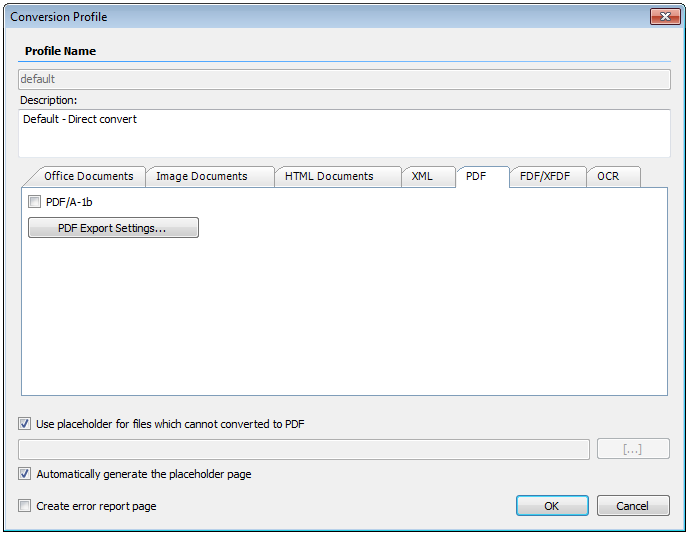 DropConvert is a Windows client application which communicates with the FileConverterPro server to convert documents to PDF or PDF/A which are dragged & dropped into a always “on top” displayed “DropZone” or into a monitored folder. The resulting files get transfered back to the client and deposited into a configurable output folder. DropConvert communicates with the FileConverterPro server encrypted via https which can be located in the local net or also external through the internet. DropConvert is free and can be installed on any Windows client and therefor brings the PDF and PDF/A conversion functions to any working place. For testing without an own installation of the FCpro server our testserver, provided over the internet, can be used. 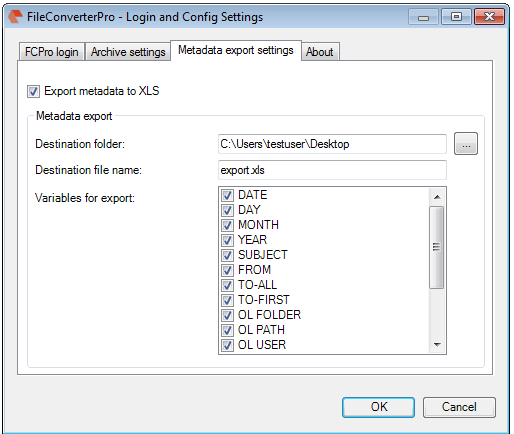 This client application is included in the FCpro setup and is installed with the FileConverterPro Server. With it all function available via web-service can be tried and tested. Beside the EXE the application is also available as C# source code project to integrate FCpro functions in own applications quick and easily. 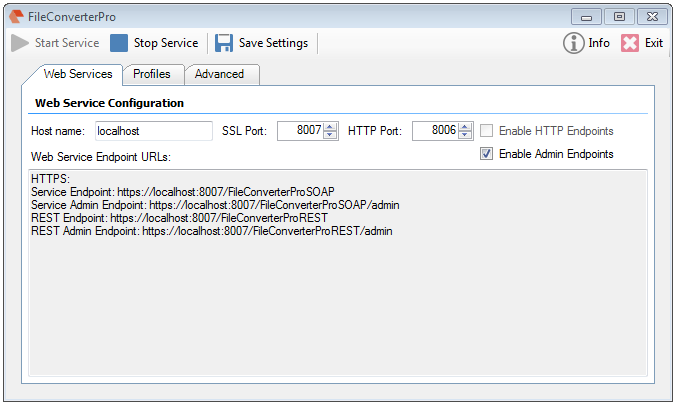 “Connect” – client connects with the FCpro server and retrieves all available processing profiles. “Statistics” – available pages (Abbyy OCR license), pages in the queue, documents in the queue, average time per document in sec. Job functions – The jobs are managed through a database and can be retrieved. 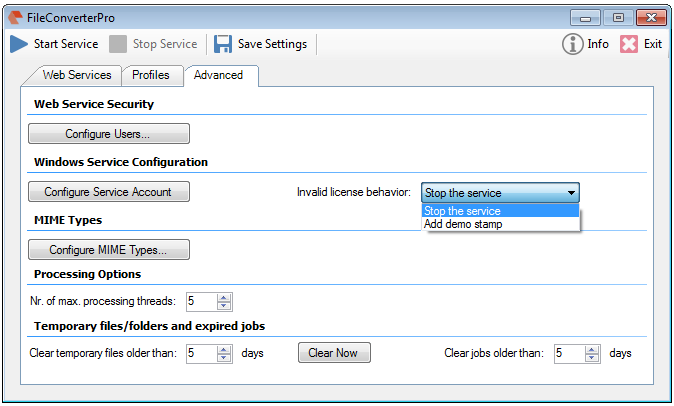 With it there are filter functions for status, username, label and date (created and converted) available. The list can be sorted ascending or descending per filter. Displaying of the overall amount of jobs as well as amount of pages and jobs per page. The job list can be retrieved page per page. Single jobs can be “aborted” or “deleted”. Also all jobs can be deleted. Display of the job list with user, date/time -created, -converted, ID, label, status, error. 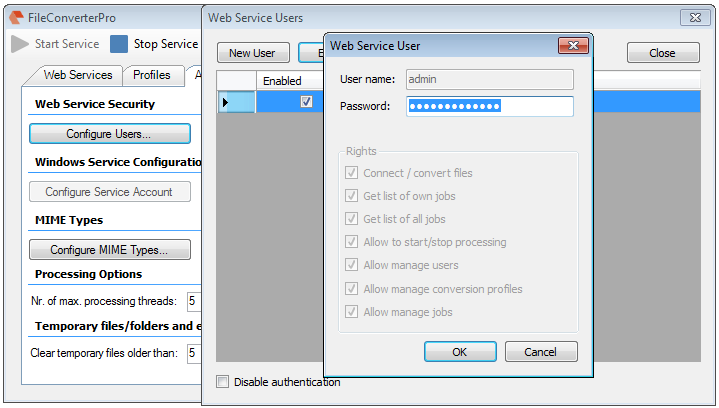 Admin service functions – for the admin an own web-service URL is available which can be addressed and used independent of the normal processing functions. 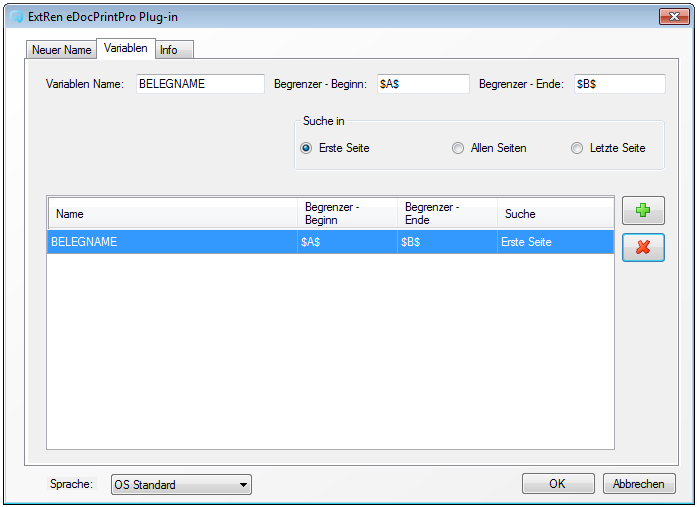 Authentification – set username & password for the connection with the FCpro server. To be able to run tests without the installation of an own FileConverterPro server there is now an encrypted reachable via https test server available. 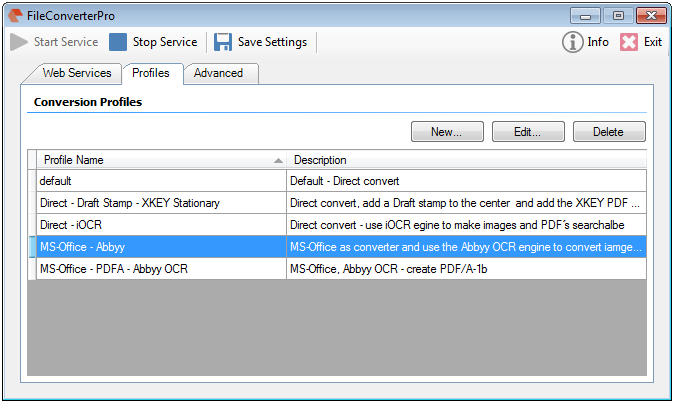 Through predefined profiles the conversion with or without MS-Office and the OCR processing with iOCR or Abbyy OCR can be tested. 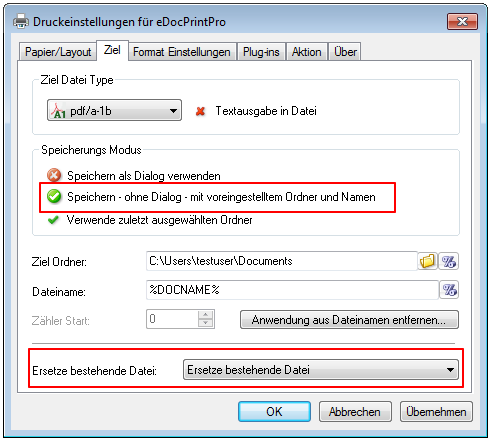 Direct + iOCR german – direct conversion without MS-Office 2010, iOCR – german, placeholderpage. Most easy way to test is to install the free available FileConverterPro Windows client – “DropConvert” and to drag the documents in the DropZone for conversion. 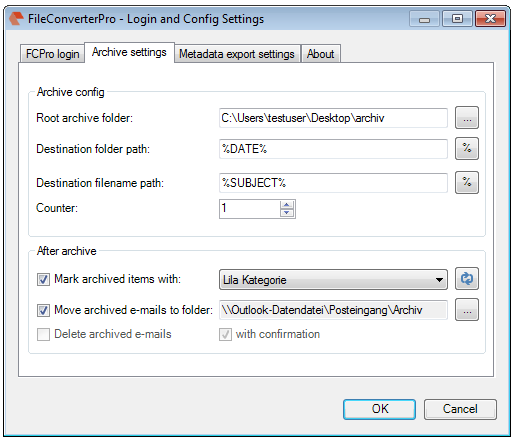 The FileConverterPro is installed as Windows service and offers functions for the conversion of the most important document formats to PDF, PDF/A incl OCR through a web-service interface (SOAP or REST). For FCpro the same base components as for the FileConverter, PDFMerge and AutoOCR are used. Adjustments and extensions are therefor available the same for all these applications. The web-service interface of FCpro is compatible to the web-service interface of AutoOCR by which all applications are runnable without adjustment with both services. With that e.g. our Alfreso / ifresco Transformer integration can be operated with AutoOCR – for pure OCR processing – as well as with FCpro – to process all document formats incl. OCR. As well as for AutoOCR also for the FCpro service is a ready-to-use .NET / C# sample application with EXE and source code available. With it the FCpro functions can be tested immediatly or the code can be used as a base for the integration in own applications. PDF or PDF/A conversion – all important file formats – MS-Office, image, e-mail, HTML and so on get converted to PDF or PDF/A automatically. Normally no other components or MS-Office are required. 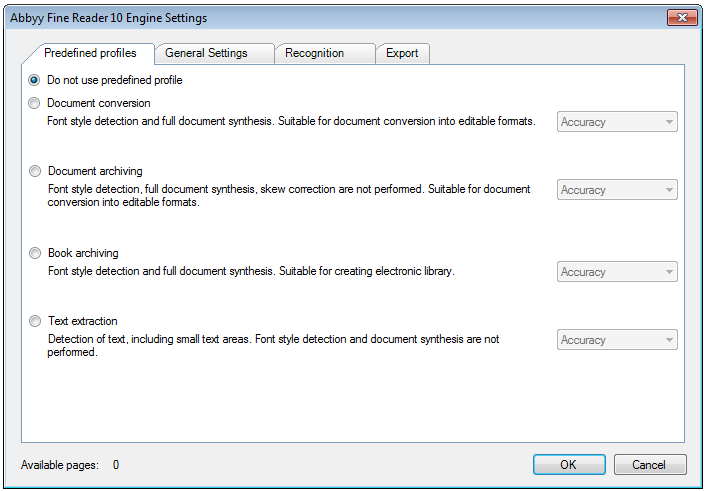 The conversion takes place directly without additional applications or printer drivers. 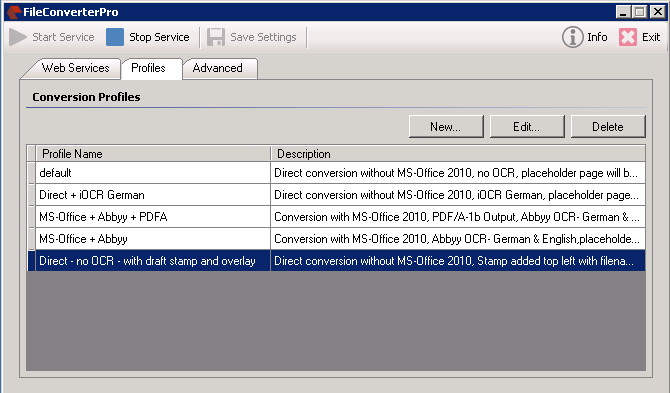 Optionally also MS-Office 2010/2013 can be used as converter component if available or a “high fidelity” conversion for office formats is required. 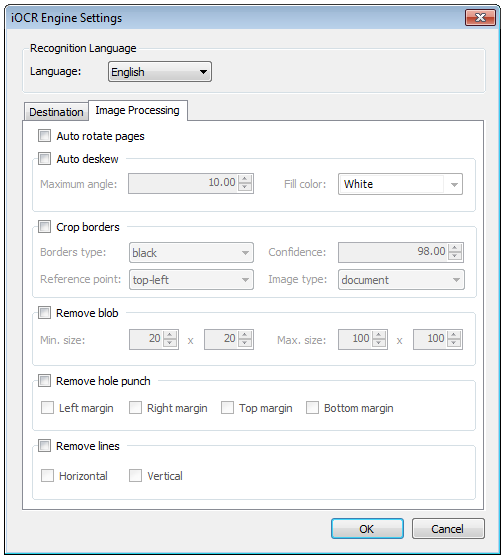 Image and PDF documents can be made searchable via the integrated iOCR. 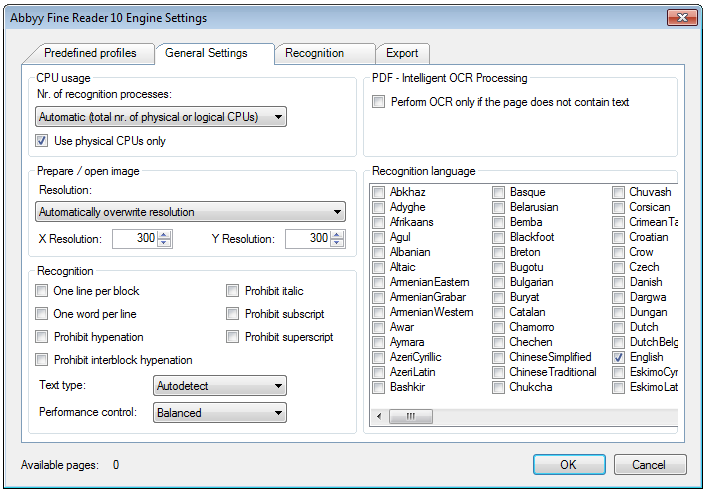 Optional through a additional license also the Abbyy OCR engine can be used. 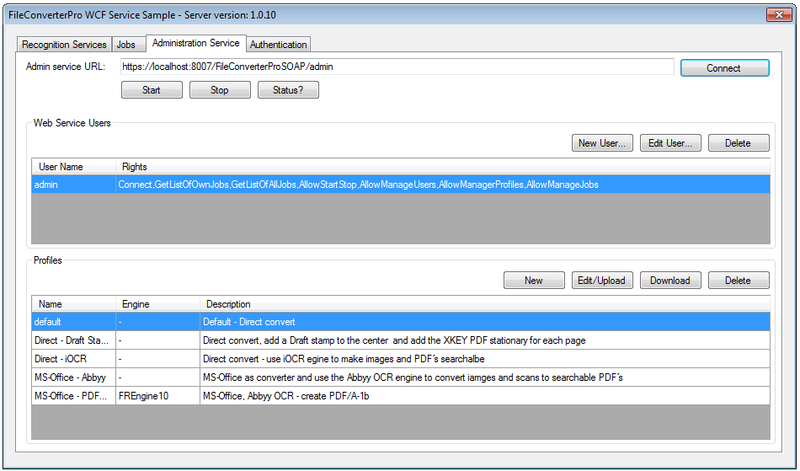 MS-Windows service application with SOAP / REST web-service interface for document conversion from Office, PDF, image, HTML, ZIP, MSG and e-mail to PDF or PDF/A. The communication takes place encrypted via HTTPS. 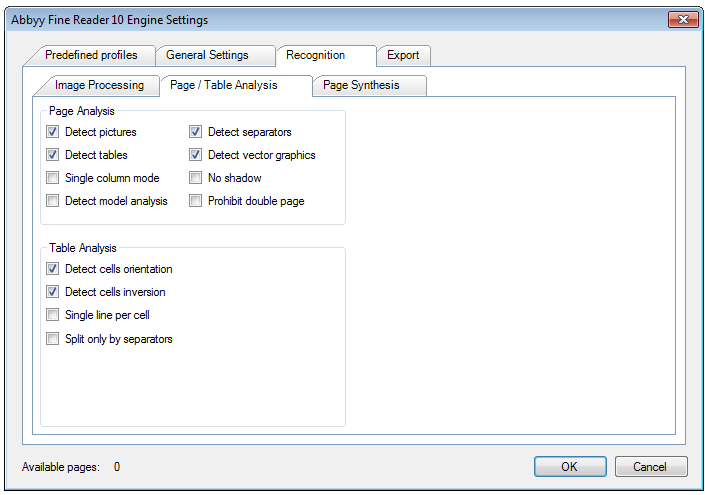 Processing profiles – all settings can be preconfigured and retrieved and used through profiles. Direct conversion without usage of additional required original applications. 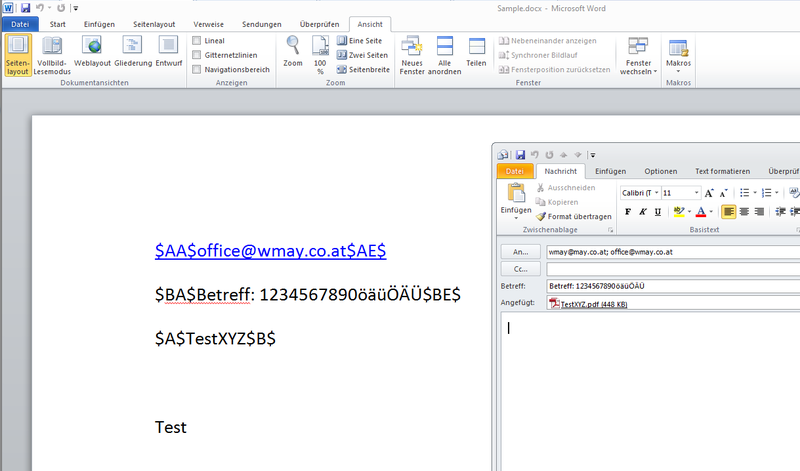 For the “high fidelity” conversion of MS-Office documents also MS-office 2010 / 2013 can be installed and used. 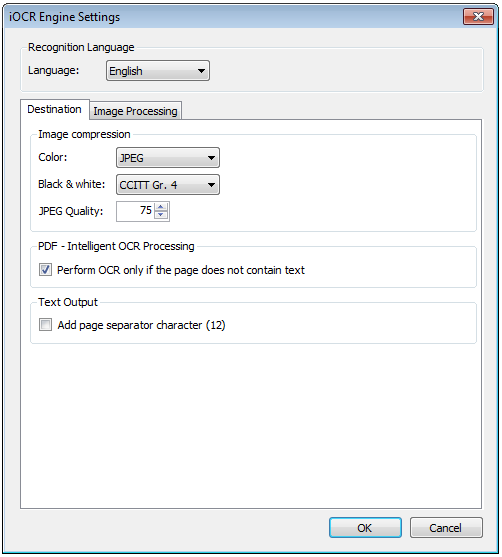 images and scans (TIF, JPEG, PNG, BMP, GIF, PDF) can be converted to searchable PDF’s with the integrated iOCR – Abbyy OCR engine as option. Parallel processing with configurable amount of processes and priorities – allows the optimal usage of the hardware and guarantees a quick work off. With ZIP/RAR/7Z conatainers all contained and supported documents get extracted automatically, converted and merged to a single PDF overall document. 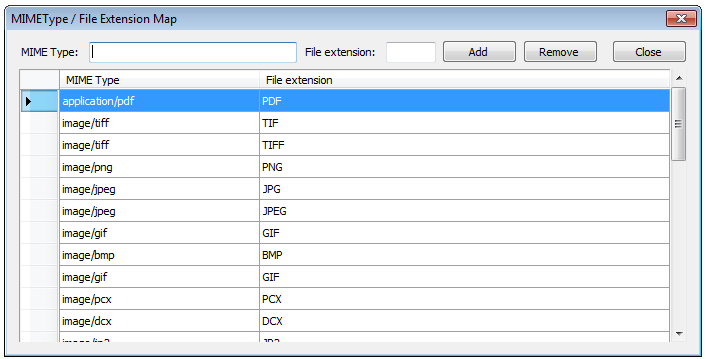 The folder structure contained in the container gets displayed in the PDF output document as the bookmark structure. MSG / EML – e-mails can contain any also interlaced attachements. This documents get extracted also, for not convertible formats placeholder pages get inserted and the structure gets displayed via PDF bookmarks. 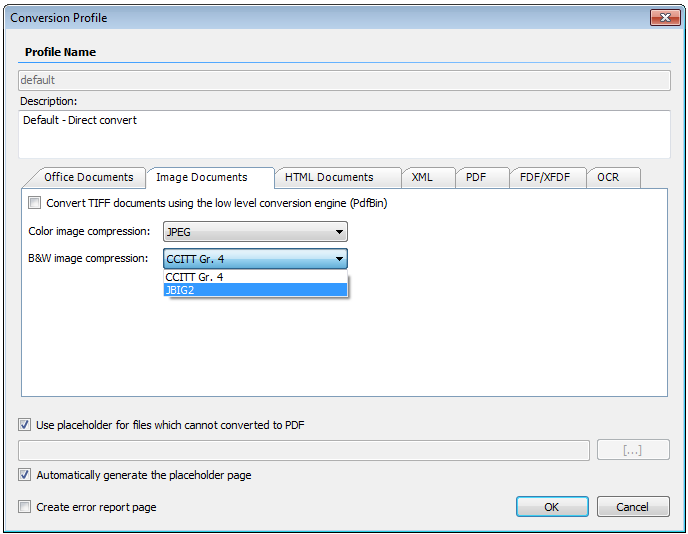 PDF/A conversion – the FCpro is also a PDF to PDF/A converter. The converted documents can be produced as PDF/A-1b or also with embedded source documents as ISO standardized PDF/A-3b format. Therefor the FCpro service is suited ideally for long-term archiving of documents and e-mails. PMTX – is a XML data format from PDFMerge which contains structure and processing information as well as the documents themselves. 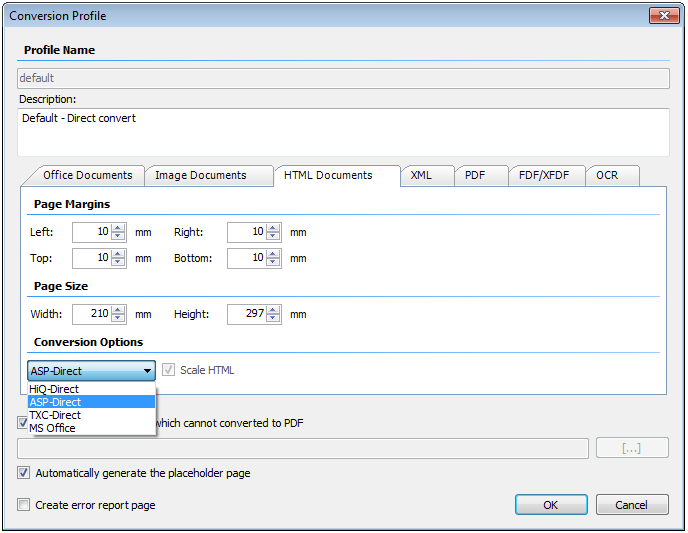 From it PDFMerge creates a single overall PDF file which consists of the converted and merged single files. The PDFMerge structure gets displayed via the PDF bookmarks. 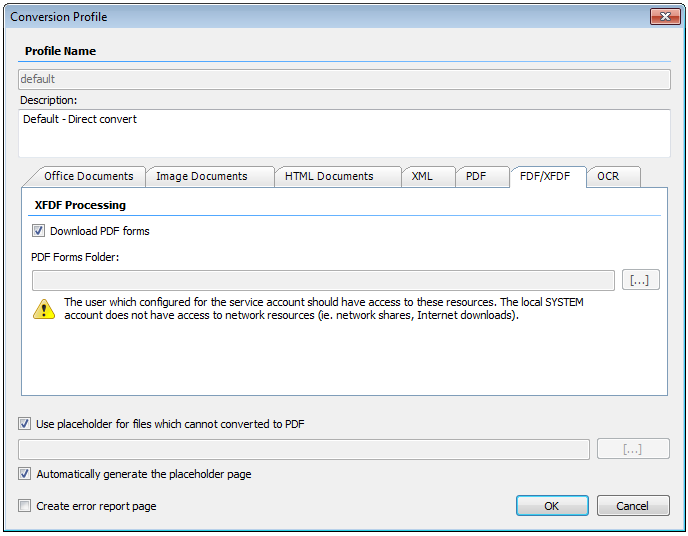 FDF, XFDF – PDF form data – can be fused with PDF forms and converted to a “normal” PDF. 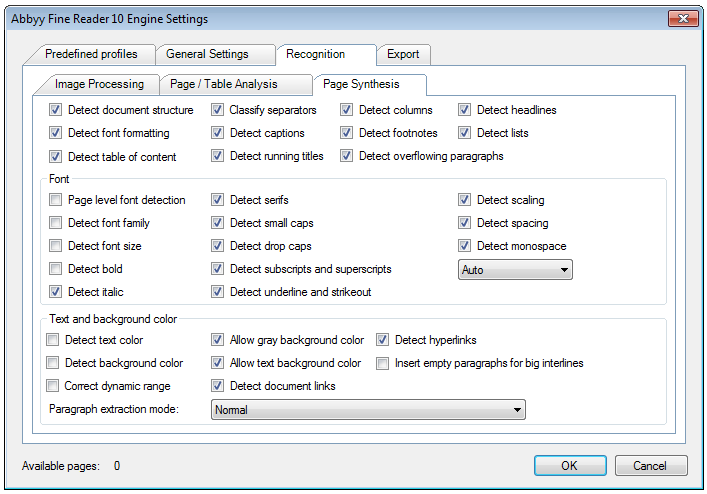 Intelligent OCR of PDF – PDF documents get analyzed page per page if OCR is required or not – pages which already contain text don’t get OCR processed again, bookmarks and links stay preserved. This saves time and resources and increases the quality. 1.) 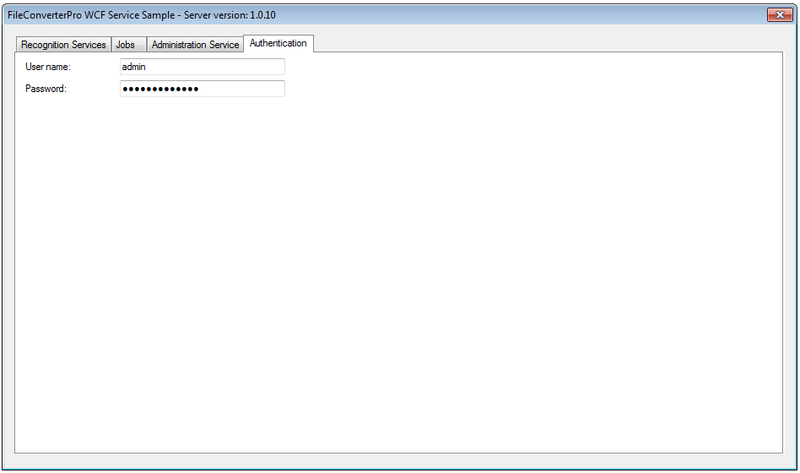 FileConverterPro – WCF service sample – this client application is additionally installed with the FCpro setup. With it all function availabel via the web-service can be tried and tested. Beside the EXE is this application also available as C# source code to be able to use FCpro functions from own applications quick and easily. 2.) 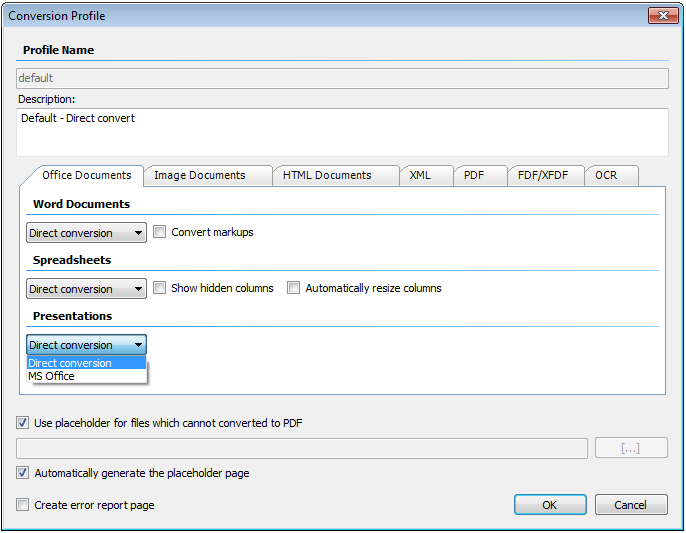 DropConvert – convert documents to PDF(/A) via drag & drop or folder monitoring. 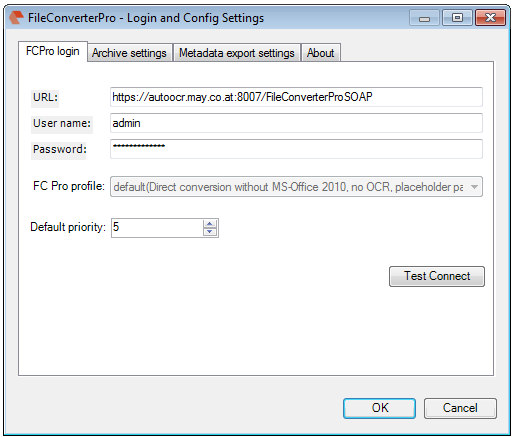 DropConvert is a Windows client application which communicates with the FCpro service to convert documents which are dragged into the always “on top” displayed “DropZone” or into a monitored folder to PDF or PDF/A. 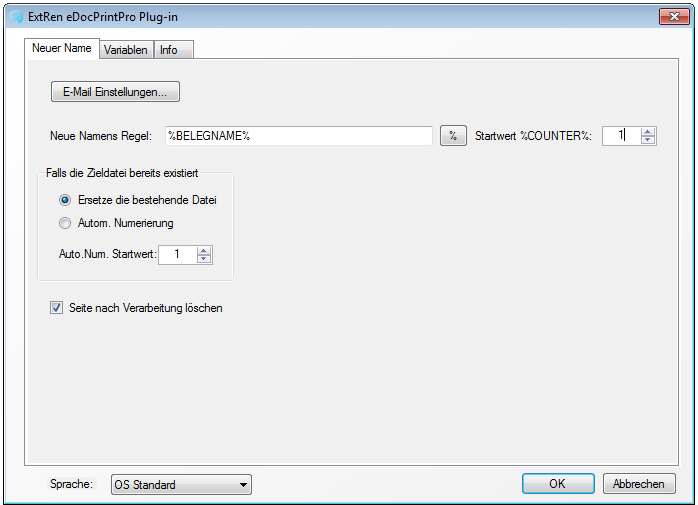 The result documents are transfered back to the client and deposited in a configurable output folder. The FCpro server is called https encrypted through the local net or also external through the internet. 3.) EMail Archiver – The EMail Archiver is a MS Outlook 2010 / 2013 plug-in with which single or multiple marked e-mails or even whole e-mail folders and subfolders with all contained e-mail masseges can be converted to PDF or PDF/A directly out of MS Outlook. The processing and conversion of the e-mail runs via the FCpro server which is called encrypted via https on the local network or external through the internet. 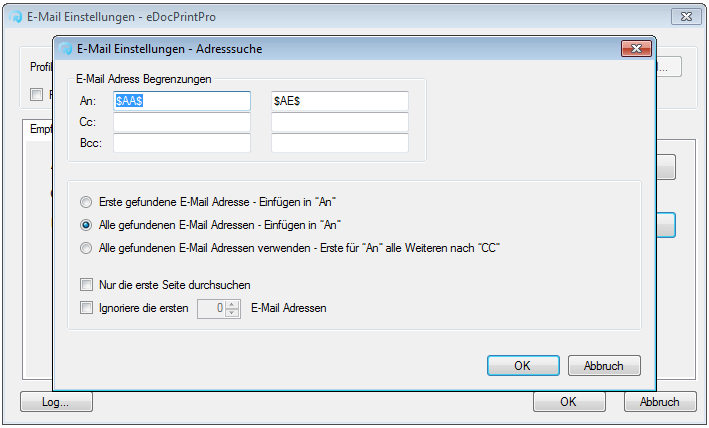 The resulting PDF(/A)’s get deposited in a configured start-folder and path into the file system with the variable information extracted from the e-mail. PDF/A and especially PDF/A-3 are particularly good for the archiving or for ISO standardized long-term archiving of e-mails. 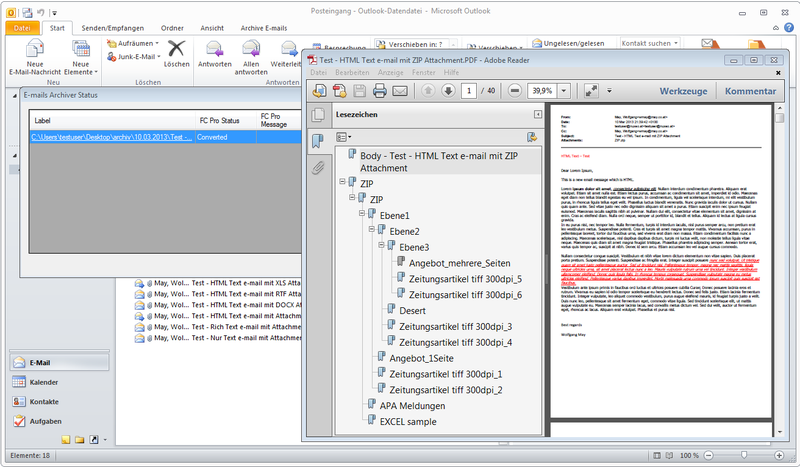 With PDF/A-3 the original MSG / EML messages get embedded also in the PDF container. The FileConverterPro is available in a basic version as well as in an extended version incl. PDF/A and OCR. With the extended version optionally the Abby OCR engine can be licensed additionally to the iOCR. Abbyy licenses are available page (monthly or overall volume) or processor dependent. The FCpro standard license is per server but there are also “Enterprise” for any amount of servers per company and “OEM” licenses for the integration through developers in their own applications. 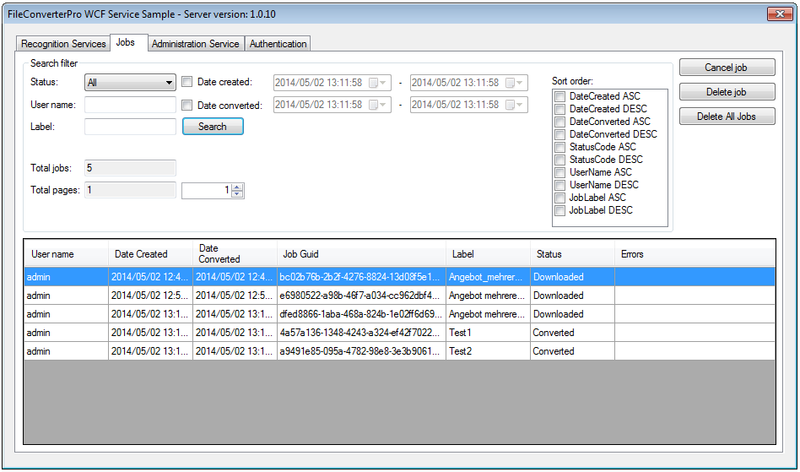 Also containing in the FCpro server is the – WCF service sample application incl. source code and the MS-Windows application “DropConvert” – this can be installed and used on any workplace without restrictions. PDFMerge can also be called with commandline parameters. Especially interesting thereby is the possibility to run the processing “silent” without user interface. With that e.g. overall PDF’s can be produced directly without user interaction through PMT (XML) files which are created from own applications. But it is also possible to work completely without template file only through a root folder to process the whole folder structure with any contained files. As first parameter the file name of the PMT or PMTX template file or the path to a folder has to be provided like in the example above. If the path to a folder is provided the folder and all contained subfolders and files get read in and processed. 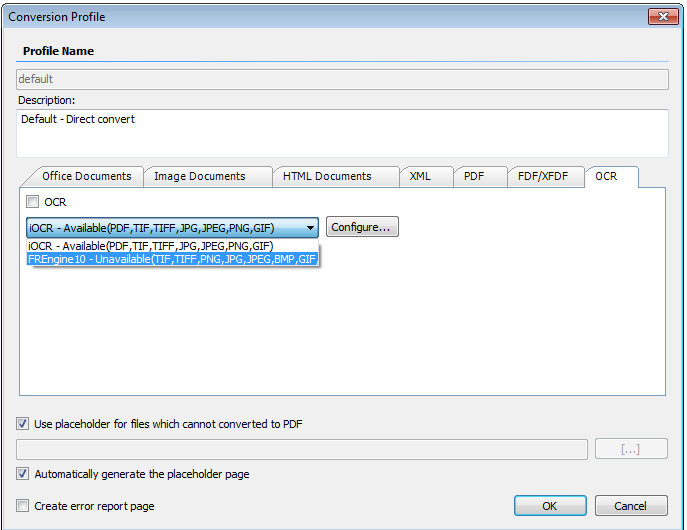 If a folder is used the “pdfpath” parameter should be used for defining the destination PDF file. 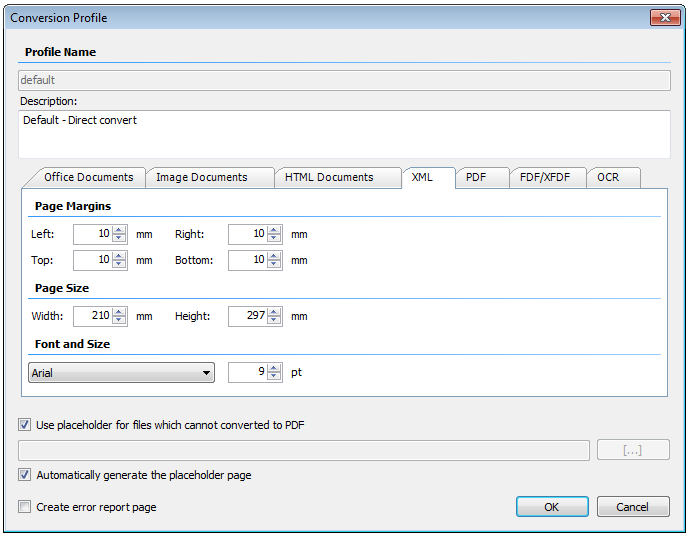 If this parameter isn’t specified the PDF file gets created on the same level as the folder chosen for processing and with the same name and there it could be that the required rights for the creation are missing.